to keep La Musa happy, nope, I have gone and signed up for Ms MAM's Sketchbookery class as well. Considering that it starts on July 1, that should give me enough lead time to get my house in order and organize some sort of studio in which to put all my play stuff that I will no doubt be using. I am also thrilled that my conversation with John (a good friend and WordPress genius) led to him helping the Ms MAM get her new Sketchbookery site launched! Yay for networking! I actually started sketching on our recent trip to the States, so I do have a sketchbook cobbled together but I think I will need a bigger one. 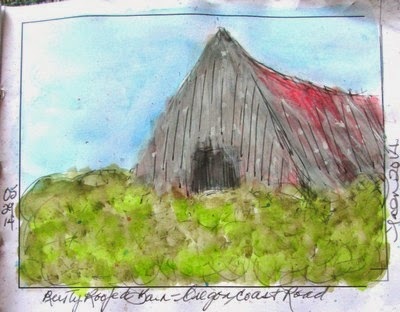 Here is one of my sketches from the trip: the blackberry brambles had almost entirely taken over the barn! Blessings to all those sketchwarriors out there, braving the bugs and the elements while you 'art'!